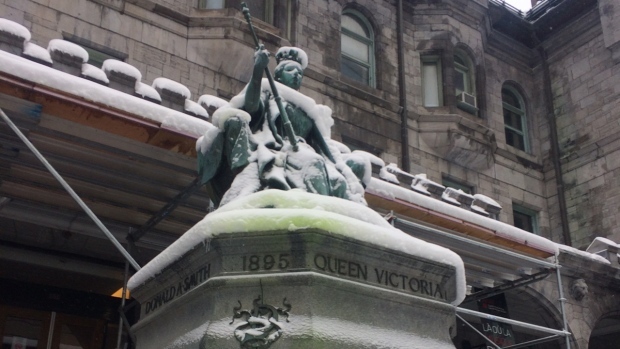 Montreal, March 24, 2019 — A landmark bronze statue to Queen Victoria, unveiled in 1900 and located on Sherbrooke Street at McGill University, was vandalized last night, in advance of the upcoming Demonstration Against Racism and Xenophobia. Queen Victoria statues in Montreal were targeted at least three times last year: this past Christmas Eve by Santa’s Rebel Elves, on Victoria Day by the Henri Paul Anti-Monarchy Brigade, and on St. Patrick’s Day (2018) by the Delhi-Dublin Anti-Colonial Solidarity Brigade itself. According to Séamus Singh of the Brigade: “This year we decided to wait one week after St. Patrick’s Day, to better time our action with anti-racist organizing in Montreal.” The Brigade emphasizes, however, that they are not involved directly or indirectly with the organization of today’s important anti-racist march. The Brigade asserts that the presence of Queen Victoria statues in Montreal are an insult to the self-determination and resistance struggles of oppressed peoples worldwide, including Indigenous nations in North America (Turtle Island) and Oceania, as well as the peoples of Africa, the Middle East, the Caribbean, the Indian subcontinent, and everywhere the British Empire committed its atrocities. The statues are also an insult to the legacy of revolt by Irish freedom fighters, and anti-colonial mutineers of British origin. The statues particularly deserve no public space in Quebec, where the Québecois were denigrated and marginalized by British racists acting in the name of the putrid monarchy represented by Queen Victoria. Queen Victoria’s reign, which continues to be whitewashed in history books and in popular media, represented a massive expansion of the barbaric British Empire. Collectively her reign represents a criminal legacy of genocide, mass murder, torture, massacres, terror, forced famines, concentration camps, theft, cultural denigration, racism, and white supremacy. That legacy should be denounced and attacked. Last night’s action is motivated and inspired by movements worldwide that have targeted colonial and racist statues for vandalism and removal: Cornwallis in Halifax, John A. Macdonald in Kingston (Ontario) and Victoria (BC), the Rhodes Must Fall movement in South Africa, the resistance to racist Confederate monuments in the USA, and more.